It´s like when you sweep the floor. You make a dirt pile, scope it and throw it in the bin. SELF-CLEANING POOL does all of this for you. Enjoy the pool that cleans itself, saves money and uses less chemicals, while you are having fun with your kids. All this is enhanced by high performance, reliability, and flawless design. 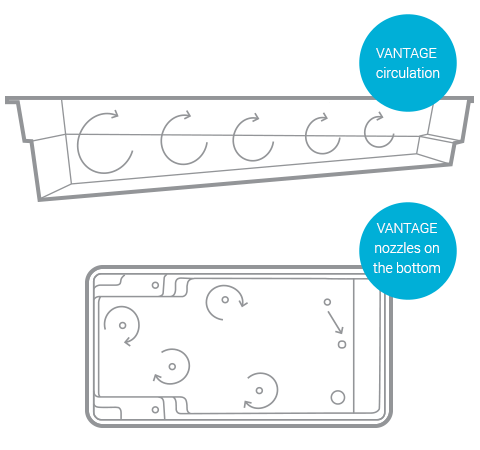 The VANTAGE system is almost invisible and will not disturb the look of your new and beautiful pool. The nozzles and accessories for the VANTAGE system are available in three colours complementing the colours of your pool. Why you must have it? cleans all debris and dirt. …all that you do is enjoying your pool!